TripleComp, Other software dynamics processor from Sinusweb. Sinus has released an x64 (64-bit) version of TripleComp version 1.5 for Windows. 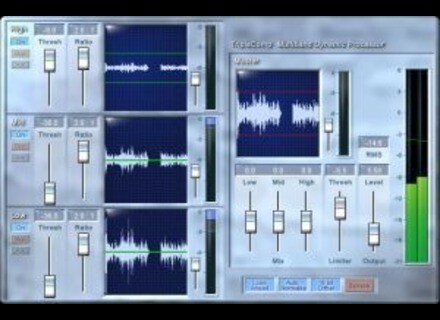 TripleComp is a three band compressor/limiter plugin designed to boost the loudness of your music in a comfortable way. It is intended for "inaudible" compression at the mastering stage, not for sound design. TripleComp splits up your audio signal into high, mid and low frequency bands. These bands are processed individually by three independent compressors, which you can see on the left of the user interface. Each compressor has its own wave display and reduction meter. In the Master section the three compressed signals are mixed together again. Then the overall signal can be limited by using the brickwall limiter of this section. TripleComp's compression/limiting algorithms react to peaks, not to the energy (RMS) of the signal. That's why you hear no pumping or coloration effects. Note that there exist no faders for setting attack or release times. These values are calculated automatically and depend on the characteristic of the input signal, the amount of compression, the attack enhancement mode and several other factors. TripleComp's look-ahead processing avoids distortion artifacts even under heavy compression, the company says. The dynamic resolution of TripleComp's audio processing is 32 bits, which is more than 180 dB. 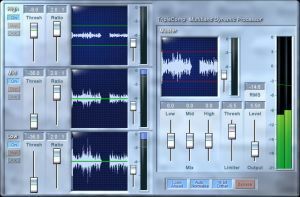 The plugin is suitable for sampling rates up to 96 kHz. Automatic attack and release time calculation. Sample rates up to 96 kHz supported. Sinus Wave Display Interface (SWDI). It is available as a VST effect plug-in and costs $45. EastWest Updates Play & Hollywood Strings EastWest has updated PLAY to version 2.0.25 and Hollywood Strings to version 1.0.3. Zephod [BLOK] Modular Updated Zephod has updated the stable version of [BLOK] Modular to SVN 300 and the beta version to SVN 331. 2CAudio Aether v1.5.1 w/ Pro Tools RTAS 2CAudio has announced the release of version 1.5.1 of Aether, which includes RTAS support for Pro Tools HD, Pro Tools LE, and Pro Tools M-Powered users.